The Federal Reserve talks about interest rate hikes, and three big earnings announcements are on tap -- all during the trading week of Oct. 26 through Oct. 30. Stocks are firmly in rally mode as we close out the month. 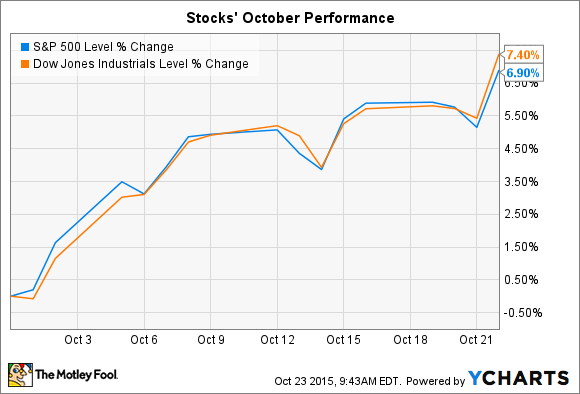 Both the S&P 500 (SNPINDEX:^GSPC)and the Dow Jones Industrial Average(DJINDICES:^DJI) rose by nearly 2% last week, making October a particularly good month for investors. The indexes are each up about 7% since the end of September. Looking ahead, the Federal Reserve holds its second-to-last committee meeting of the year this week, after which it will release an official statement on Wednesday. That report will be heavily followed and scrutinized for clues on the timing of an eventual interest rate hike by the central bank. But the coming week is all about earnings. Hundreds of public companies are set to post third quarter results over the next five trading days, including Twitter (NYSE:TWTR), Buffalo Wild Wings (NASDAQ:BWLD), and Starbucks (NASDAQ:SBUX). You can excuse Twitter shareholders for being a bit edgy this week. After all, their stock plummeted by 30% in the days the previous quarterly report. In that July announcement, Twitter posted blistering revenue growth of 61% as it made improvements to its advertising platform. But user growth slowed to a crawl -- just 12% -- which raised questions about the company's long-term profit potential. "Our Q2 results show good progress in monetization, but we are not satisfied with our growth in audience," interim CEO Jack Dorsey said at the time. Plenty has changed for Twitter since July. It has appointed a new CEO, released a major upgrade to its service, and announced layoffs aimed at speeding up the development process. Yet investors will likely be most interested in seeing evidence of those changes helping Twitter attract more members. 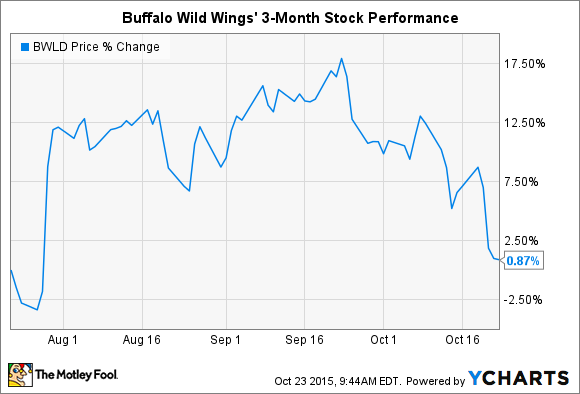 Buffalo Wild Wings stock quickly hit a new all-time high three months ago after it posted second quarter earnings results that showed industry-thumping sales growth. But shares have since given up almost all of those gains. For this week's report, investors will be focusing on three critical numbers from the restaurant chain. Comparable-store sales growth is the most important -- that figure was 4.2% last quarter but should be slightly higher this time. Then, there is food costs, which are a huge question mark given the volatility in chicken wing prices. Labor expenses are also rising as the company adds more guest experience captains to its employment rolls. Even tiny changes in either of these expense categories can have a big effect on Buffalo Wild Wings' net earnings. Starbucks is heading into its third quarter report as the eighth best-performing stock in the entire S&P 500, meaning investors are expecting good news when the coffee giant posts results on Thursday afternoon. To be sure, business was booming at our last quarterly check-in: Customer traffic surged higher at cafés around the world as earnings spiked 22%. Starbucks' biggest problem at the moment seems to be how to handle record demand for its products. And the push into offering an expanded food menu has made its locations that much more efficient and profitable lately. The strategy has also significantly improved operating metrics like cash flow and liquidity, which is one reason why Starbucks received a glowing debt upgrade earlier this month. It's likely that the coffee chain will report more solid growth in the quarter that just closed (Wall Street expects 17% higher sales and a 14% profit increase). Shareholders should also hear from founder and CEO Howard Schultz about the company's holiday season strategy and progress regarding customer experience improvements through initiatives like mobile ordering and home or office delivery.